Disneyland Resort Ambassadors Allie Kawamoto and Jessica Bernard, Mickey Mouse, Jason Cooper from KaBOOM! and Brent Dennis, Community Services Director for the City of Anaheim announce Disneyland Resort will build five new KaBOOM! playgrounds in Anaheim in the next three years. ANAHEIM, Calif., October 1, 2016 /3BL Media/ — Today, residents of the city of Anaheim discovered that as a result of their votes, Anaheim will receive five new KaBOOM! playgrounds in the next three years. 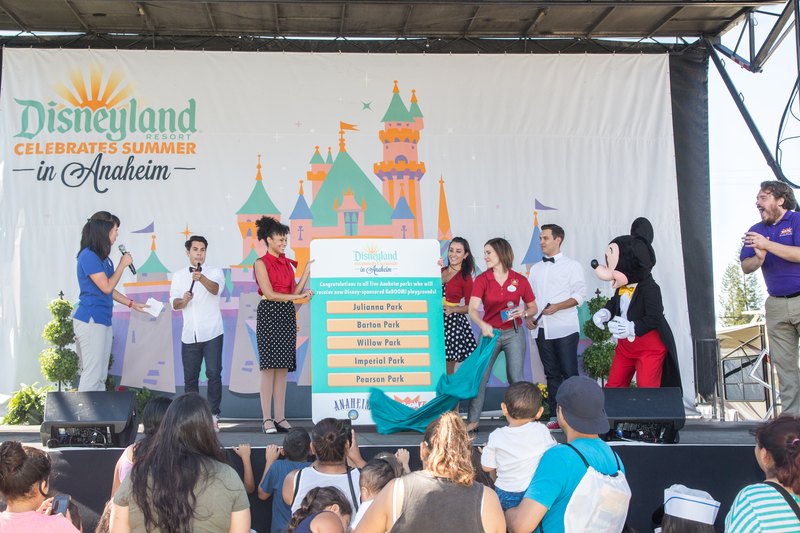 All summer long, Disneyland Resort has been celebrating the final moments of its 60th Diamond Anniversary with the residents of Anaheim, hosting movie nights, weekend celebrations in Anaheim parks with Disney characters, and more. As part of the celebration, residents had the opportunity to cast their vote for play — for where the next KaBOOM! playground will be built in Anaheim. Due to the overwhelming response from Anaheim residents, Disneyland Resort has pledged to fund all five of the park builds, with the city of Anaheim and KaBOOM!. The five parks to receive playgrounds will be Imperial Park, Willow Park, Julianna Park, Pearson Park and Barton Park. This will bring the total number of Disney/KaBOOM! playgrounds in Anaheim to 12, giving more than 19,000 Anaheim children a place to play with their families. “Following a fun-filled summer of celebrations hosted by the Disneyland Resort at local parks, we are excited to maintain the momentum by building all five of the proposed KaBOOM! playgrounds right here in Anaheim,” said Michael Colglazier, president of the Disneyland Resort. “The Disneyland Resort is proud to have been part of this community for more than 60 years, and we look forward to continuing Walt Disney's dream of providing places where families can have fun together." 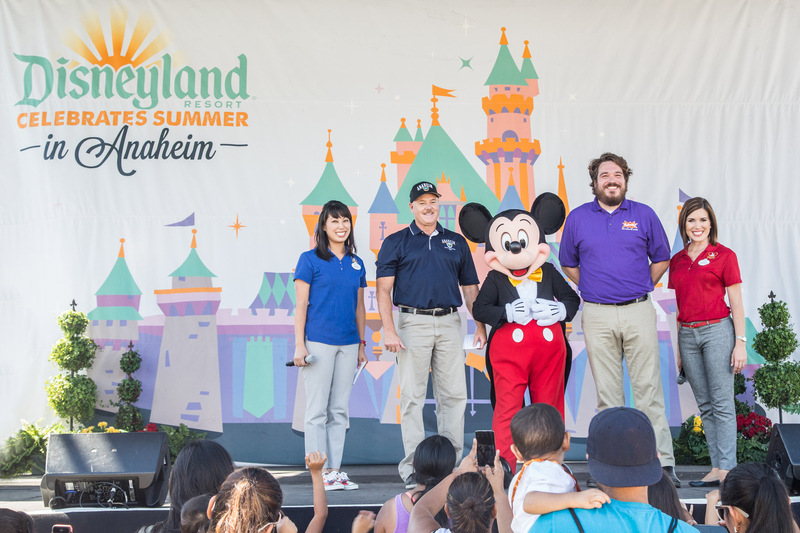 In the last five years, the Disneyland Resort has donated $16 million to Anaheim programs benefiting children and families with $1.5 million specifically dedicated to enhancing Anaheim parks. The first of the new playgrounds will be built in February 2017. Since 1996, KaBOOM! has been dedicated to the bold goal of giving all kids – particularly those growing up in poverty in America – the childhood they deserve, filled with balanced and active play, so they can thrive. The Walt Disney Company supports KaBOOM! in helping all children get the play that they need and has pledged more than $12 million since 2007 to help build playgrounds and Imagination Playground™ sets. The playground builds are an extension of The Walt Disney Company Healthy Living Commitment to creating healthier generations by bringing the gift of active play to kids and families who need it most. With its partners, KaBOOM! has built, improved and opened nearly 16,300 playgrounds, engaged more than 1 million volunteers, and served 8.1 million kids. Located on approximately 500 acres in Anaheim, Calif., the Disneyland Resort features two spectacular theme parks – Disneyland (the original Disney theme park) and Disney California Adventure park – plus the Downtown Disney District comprised of unique dining, entertainment and shopping experiences. The Resort’s three hotels are the 948-room Disney’s Grand Californian Hotel & Spa, the 973-room Disneyland Hotel and the 481-room Disney’s Paradise Pier Hotel. With 29,000 cast members, the Disneyland Resort is Orange County’s largest employer and generates $5.7 billion for the Southern California economy. The Resort has welcomed more than 750 million guests since opening on July 17, 1955. Anaheim is a full-service city supporting more than 358,000 residents, 20,000 businesses and 25 million annual visitors. The city provides public safety through the Anaheim Police Department and Anaheim Fire & Rescue, water and power service through Anaheim Public Utilities, parks, community centers, family services and libraries through Anaheim Community Services, neighborhood and transportation improvements through Anaheim Public Works and community revitalization through Anaheim Community & Economic Development. Anaheim is a modern, diverse city with a proud history dating back to its 1857 founding. Anaheim is known worldwide as the home of the Disneyland Resort, including Walt Disney’s original Disneyland Park, as well as Angel Stadium of Anaheim and Angels Baseball, Honda Center and the Anaheim Ducks, and the Anaheim Convention Center, the largest on the West Coast. Anaheim’s thriving visitor industry and business community help support the city’s neighborhoods and make Anaheim a great place to live, work and play. For more, please see www.anaheim.net.